A study has also found that boys are more likely than girls to find school difficult. 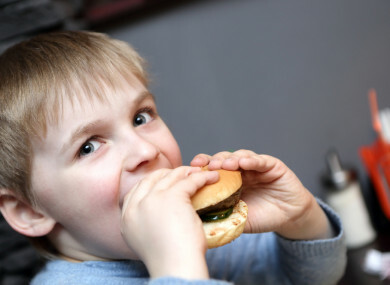 MOST SEVEN AND eight-year-olds are in good health, but obesity remains a major issue for children, according to research compiled by the Economic and Social Research Institute (ESRI). Growing Up in Ireland tracks the development of two nationally representative groups of children: an ‘infant cohort’ interviewed initially at nine months and with subsequent data collected at three, five and seven or eight years of age; and a ‘child cohort’ interviewed initially at nine years of age and subsequently at 13 and at 17 or 18 years. Findings released today describe how 5,000 seven and eight-year-olds are faring in three aspects of their lives, namely health and development; school and learning; and socio-emotional development, relationships and play. In terms of health, around 80% of the children were described by parents as being very healthy with no problems, while 19% were described as healthy, but with a few minor problems. This has been the general picture since they were nine months old. The report states that being overweight or obese “remains a major health problem, particularly among children from low-income families”. Some 15% of children were reported to have been overweight and 5% as obese. Some 27% of children from the lowest income families were overweight or obese, compared to 16% of children from the highest income families. The research found that dietary quality was linked to a family’s social class: 36% of children from families in the most socially disadvantaged group had a low dietary quality, compared to 17% of children from families with a professional or managerial background. Most children in the study were reported to have adjusted well at school. The vast majority of mothers (90%) reported that their child had adjusted easily to school. Over three-quarters (77%) of mothers said their seven/eight-year-old did not find it difficult to sit still and listen in class, although 14% said they found it difficult. Children who find it difficult to settle into school in the beginning continue to find school difficult over time, the research found. Children who were identified by their teachers at five years of age as having a negative attitude or disposition to school were reported by their mothers to have had more adjustment problems two years later. Identifying the types of children who have negative dispositions to school at an early stage helps to target those most in need of support. Boys are more likely than girls to find school difficult, according to the study. Mothers reported that 87% of boys compared to 92% of girls found it easy to adjust to school. About one in five (19%) of boys found it difficult to sit still and listen in class, compared to 8% of girls. The research found that children whose mothers have less education are more likely to find schoolwork difficult. Mothers who had third level education were less likely to say their child usually found schoolwork hard (2%), compared to mothers who had left school at Junior Certificate level or earlier (5%). Most children in the study are doing well in terms of their socio-emotional development. This was based on reports from the children’s mothers, using internationally developed and widely-used measures of socio-emotional well-being. Girls generally had higher scores than boys on measures of social skills such as assertion, empathy, responsibility and self-control. Reading, ‘make-believe’ games and playing on a computer or tablet were the most frequent play activities reported by children’s mothers. Some 35% read for pleasure every day, but 22% did so less than one or two times a week. Boys were more likely to play physically active games but also more computer games. Girls were more likely to enjoy dance, music, crafts and reading. Boys had more screen time than girls. Among all children, typical screen time on a weekday was reported to be one to two hours, but this increased to over three hours each day at the weekend. Boys had substantially more screen time than girls – 14% of boys and 10% of girls had more than three hours of screen time on a typical weekday. On a typical day at the weekend, 51% of boys and 39% of girls had more than three hours of screen time. Children whose mothers had lower levels of education have more screen time, the research found. Screen time varied significantly depending on the level of the mother’s education. Some 23% of seven or eight-year-olds whose mothers have Junior Certificate level education or less had more than three hours of screen time on a weekday, compared to 6% of those whose mother had a degree. Commenting on the findings, James Williams, Research Professor at the ESRI, said the figures provide “very detailed information to highlight the areas of children’s lives where they most need support”. The findings published today highlight the importance of early identification and intervention for children who have a negative attitude towards school from their earliest experiences of it. “Negative attitudes towards school at five years of age are reflected in the children having difficulties in adjusting to school two to three years later and to coping with the pace of schoolwork,” Williams said. Email “Being overweight or obese is 'major health problem', particularly among children from low-income families”. Feedback on “Being overweight or obese is 'major health problem', particularly among children from low-income families”.